Battlefield 1 is having a beta on the Playstation 4, Xbox One, and PC. For now, it’s available to Battlefield Insider members before opening to everyone else tomorrow morning, August 31st. I was very skeptical heading into things; the entire series feels tired and the World War One setting didn’t interest me. But after getting some time with the game, I’m cautiously optimistic. On a raw gameplay level, Battlefield 1 doesn’t function too differently from recent titles. My time in the beta focused on the traditional Conquest mode, where two teams of thirty two players compete to hold control points. It’s the usual series fair but Battlefield 1's presentation reinvigorates the gameplay by placing itself in an unconventional setting. I won’t lie; it’s strange to see World War One in this context. It’s a particularly gross low point in history, bloody and vicious. But Battlefield 1 embraces those trappings, offering a brutal experience. From bayonet charges to chemical warfare, Battlefield 1 doesn’t hold back. This direct approach makes each match feel personal and honestly a bit scary. The first time I had to toss on a gas mask in order to survive, I was terrified. Embracing the loud, percussive weapons of World War One and moving away from the more tactical tools of modern war, Battlefield 1 feels incredibly bombastic. Biplanes dogfight overhead, tanks blow buildings apart, and infantry battles are swift and cruel. There’s a terrible feeling that comes from sneaking behind an enemy and clubbing them to death. It’s all there, with astounding sound design and visuals that really drive it all home. Death can come from anywhere. This all came to a head in a glorious moment where I was trampled by a horse. Some things do work better than others. I’ve never really enjoyed how the Battlefield series handles respawning and it’s far too common that you’ll leap right into the fray only to be shot death within moments if you spawn on a teammate. If not that, you’ll spend an inordinate amount of time traversing large maps to reach objectives. It creates an inconsistent play experience and leaves you with a lot of time where you’re either dead or just way too far away from the action. Vehicles are a prominent feature within the series but feel difficult to deal with here. A single tank can clear out a control point with little effort. Battlefield 1's strong infantry game actually begins to suffer when you toss these deadly machines into the field. Which is a genuine shame because moment to moment gunfights here offer some of the best in the series since Battlefield Vietnam. Look at that majestic steed! Battlefield 1 feels far more technical than an entry like Bad Company 2 or Battlefield 4. Guns are more temperamental and require you to focus a lot more on controlling recoil. Loadouts strictly define roles while still offering a lot of potential personal affectations. I felt limited when I first tried to play as a medic until I switched out my gear and found a great mid-ranged carbine. Finding the right kit feels more important here than ever. The ominous specter of EA’s homogenization isn’t completely gone. 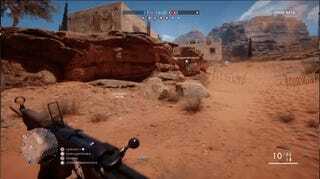 Loading up Battlefield 1 felt oddly similar to launching Star Wars Battlefront. It gives me pause and makes me seriously doubt that EA will break away from their model of DLC or confusing online clubs and services. Playing Battlefield 1 gives me a lot more confidence though. If anything else, it seems a nice change of tone from previous entries. There’s something with character here; Battlefield 1 actually feels like a distinct title and not another throwaway entry to the series. I really hope the game continues in this direction. Before playing, I was merely curious. Now? Battlefield 1 has my attention.